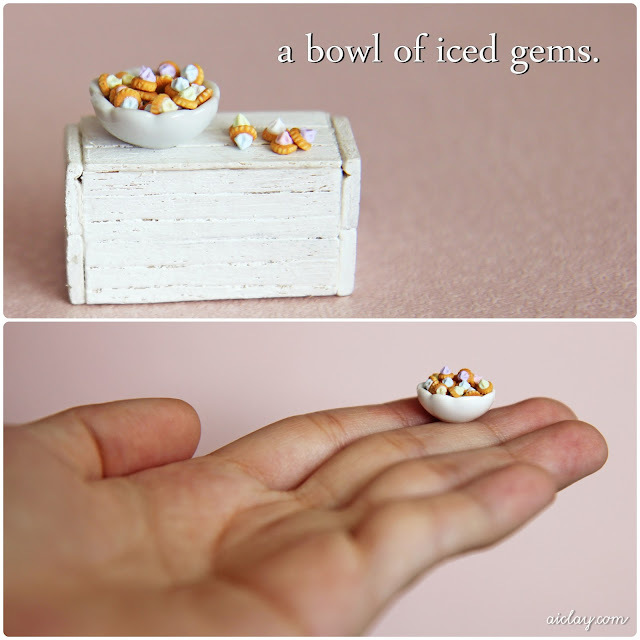 AiClay - a Haven of Miniature Food: Miniature iced gems. So it's been a pretty nua Sunday so far, headed out for roasted pork and rice for brunch with the family and am back home now. It's my grandma's birthday today (sheng ri kuai le ah ma!) and I'll be trooping over to her house for just a small get together. Probably armed with a cake haha. Speaking of cakes, I got a bag of iced gems at the bakery just now! Guess the craving kicked in while I was editing the photos of the miniature ones I had made. And look at little Mio enjoying the colourful treats, she's so adorable I couldn't not put this up. Felicidades a tu abuela, espero que lo hayais pasado bien.......aunque hoy estes "nua"....mañana sera un buen dia....seguro!!!!! Me encanta ese bol lleno de deliciosos ducles.